The local community benefits from our 2,000 student volunteers - almost five times the national average. We lead the White Rose Innovation Partnership involving over 290 companies and organizations with White Rose Universities and the University of Bradford, along with university and medical partners in the USA. The Rolling Stones, The Who, Led Zeppelin, Pink Floyd, The Kaiser Chiefs, Arctic Monkeys, Editors and Klaxons have all played at the University Refectory. The Students' Union is one of the largest and best in the country with 300 activities, clubs and societies. Our single campus is a ten minute walk from Leeds city centre. By 2015 we will have spent 195m pounds on new buildings and refurbishment to create the environment to pursue excellence in research and teaching. Our students and staff - and Leeds residents - will benefit from new sports facilities including a swimming pool and health and fitness complex. We have won more environmental awards than any other UK university, including the 2009 Green Gown Award for Continuous Improvement in relation to our transport plan. Leeds is the UK's Major Financial and legal centre outside of London. It's central positioning, midway between Edinburgh and London places Leeds at the heart of the UK and makes it an ideal centre from which to visit other parts of the country. Leeds is served by two major airports: Leeds Bradford and Manchester Regular flights are available from a huge number of European and International cities. Leeds Bradford airport is approximately 7 miles away from the University, so easily commutable by taxi. 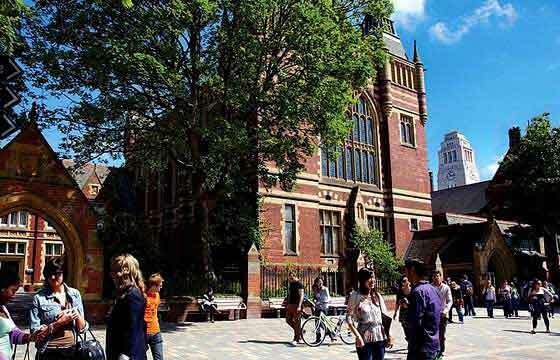 The University of Leeds has one of the largest scholarship and international funding programmes of any UK University. Different types of scholarship and levels of funding are available. University scholarships providing full fees are administered by the Scholarships Office. Many Leeds departments also offer part bursaries. This is to help talented students reduce the cost of undergraduate and masters level study in Leeds.